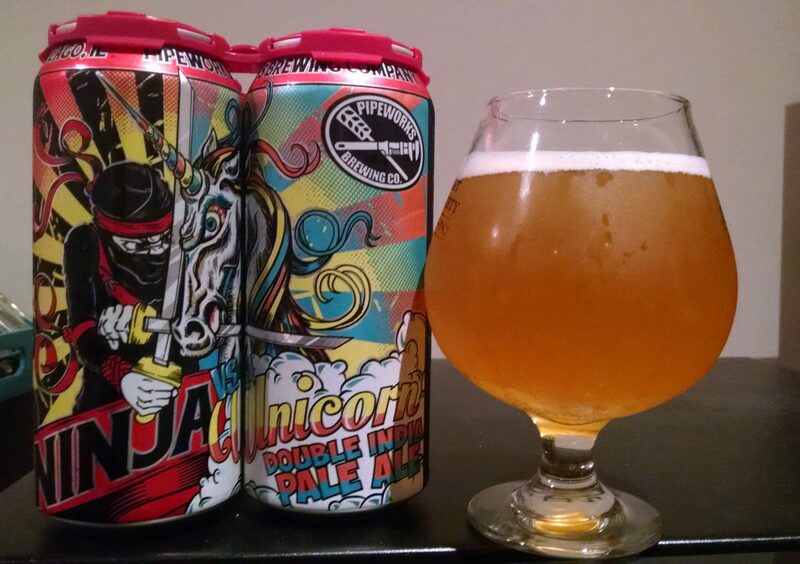 Apparently the ninja won the battle, though it was the unicorn that won the war by getting featured in another brew. 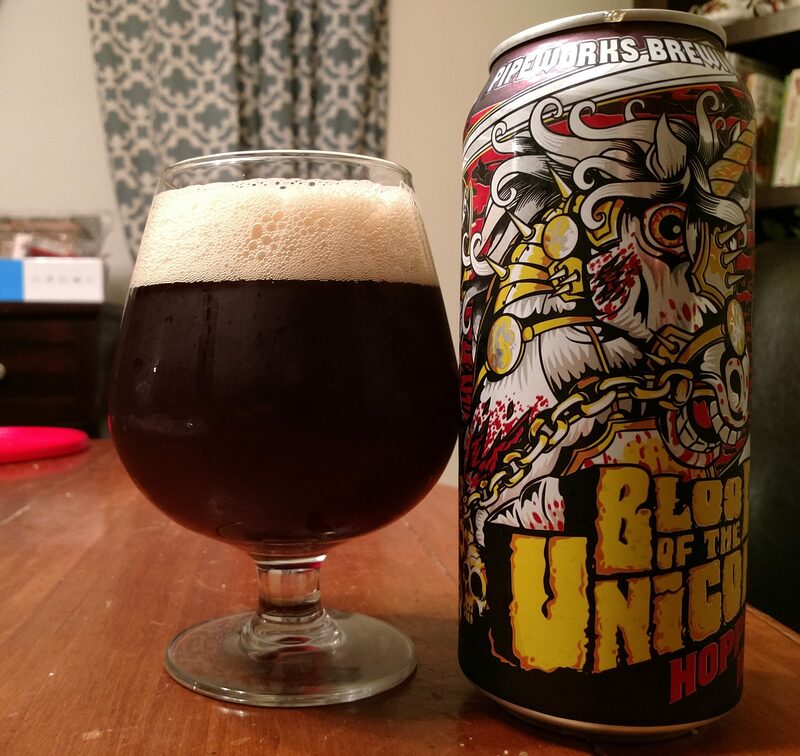 This next beer caught my attention by being a style that I love and by having some pretty cool can art, featuring the most bad badass zombie/metal unicorn ever. I have a steady supply of brews left to get through now that Halloween is approaching and this seemed like the perfect way to lead the charge! Description: Not much official information to go by other than style description. I’ll add that this particular can was born on the day of my anniversary (9/18), which was a nice coincidence. I think the single can cost me $3-4, with a four pack going for $11.99 in my area. Appearance: It had a deep reddish-brown body with thick, foamy light tan head. Smell: Sweet, caramel malt and raw, piney hops. Taste: A slightly more subdued version of the smell. There was some malt sweetness upfront, but piney hops were clearly the stand out flavor on the front end of this beer. The finish did see a return of sweetness in the form of caramel malt and a bit of brown sugar. Mouthfeel: Slightly sticky medium body with a moderate amount of carbonation. Hype: I don’t think this is particularly hyped in the beer community at large, but I was immensely excited to try this. I love the style and really enjoyed that other unicorn themed beer from this brewery recently. Overall: I thought this was pretty good, though as I am always quick to point out, in being such a big fan of this style I am fairly particular in what I want out of it. This may sound blasphemous, but I wish the malts stood out a bit more. The bitterness level was fine, I just would have liked the malt profile to have been on a similar level. This might be a “me thing” though, so don’t let that stop you from checking this out. I do wish I had bought more than just the one can I used for this review. I’m just going to come right out and say it. I was feeling indecisive in the store and bought this based on the name and artwork alone. I think I’d heard of it in passing at some point, but it was the branding that got me. Come to think of it, this is the second time in recent months that a Chicago brewery has lured me in this way. Description: There wasn’t much on the official site about this release, though a few other sources have this listed an unfiltered DIPA brewed with over 5 pounds of hops per barrel. I don’t remember exactly, but I paid somewhere in the neighborhood of $12-13 for a 4-pack of 16 oz. cans. Appearance: Cloudy, dark straw yellow body with a thin layer of white foam on top. Smell: Sweet, mostly tropical, fruits with a touch of resinous pine sap in the background. Taste: Keeping in line with the smell there was a lot of fruity sweetness upfront, mainly pineapple, tangerine, and mango. It finished with a dry, crackery malt base joining forces with mix of earthy and piney hop bitterness. The initial sweetness lingered on through to the finish as well, culminating in a slightly hot aftertaste that lessened in intensity as the beer went on. Mouthfeel: Fluffy, medium-plus body with pretty much the typical moderate carbonation you would expect for the style. Hype: I was excited for this one. Pipeworks in upping their distribution in my area so I was curious to try them out. I also really wanted this beer to live up to the awesomeness on the label. Overall: Definitely a quality DIPA. I wish the finish was just a bit more tame, otherwise this would have been a smash hit for me. Still a great beer though. If I ever need a ninja or unicorn themed brew (which all things considered is actually pretty likely for me) I’ll be picking this up again.